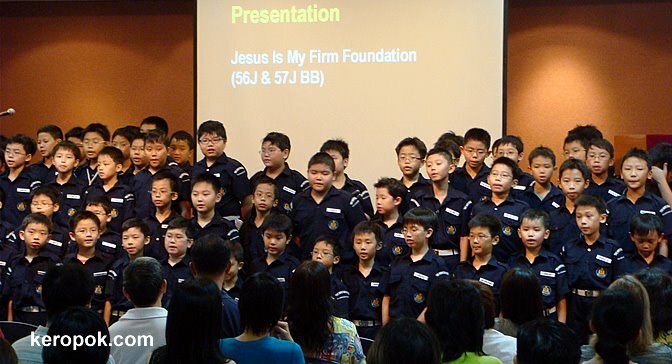 Earlier today at church, the Boys Brigade performed a song for the congregation. They were singing with such conviction and enthusiasm. Part of the big group of young boys who performed. It is the 2nd service for the day. At the earlier service they had the BB/GB Enrollment Service 2008. These young ones will be the leaders of our future. Anyone from the Boys Brigade or Girls Brigade? What a great looking group of boys! And I'll bet being with them is fun and energetic!! Good to see the kids getting out and about. I hope they have a 'girls brigade' too! Hmm one day maybe I will volunteer my time . hehe.. Right now, I have too many things on my plate. Yes they do! There's a girls brigade too. Nice to see BB over here..
57 junior company is my primary school company! So good to see that their numbers have grown and that the Lord has shown his face to them! Yes, yes. 57 is Pei Hwa Primary. There is a GB too!